Many nonprofits count on fees from client services as part of their annual income. It is a common misperception that all nonprofits get all their revenue from donations. In fact in 2013, according to the Urban Institute, 72 percent of charitable income was earned. That is, nonprofits commonly sell things or services to support their missions. The amount of revenue that nonprofits receive in this way varies widely. At one extreme are large institutions such as hospitals and universities. They enjoy tuition income, athletic income, charges for health care services, and much more. On top of their earned income, these institutions are vigorous fundraisers as well. 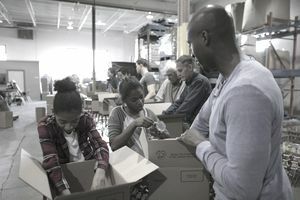 At the other extreme are charities such as a local homeless shelter that may depend on donations from individuals and corporations plus some local government grants. If your nonprofit does decide to charge a fee for some service or if you sell a product, you should be aware of several things first. For instance, the activity generating the earned income must be connected with your organization's mission. If it is not, you may be subject to the Unrelated Business Income Tax or UBIT. You put that mission on your application for 501(c)(3) tax exemption, and the IRS expects your nonprofit to operate according to that mission. Nevertheless, determining whether a business activity is mission-related can be complicated. For example, your charity decides to set up an ice cream business to support its work. That probably is not related to your mission. But, if you set up that business to provide job training to the disadvantaged young people that your charity serves, that is connected to your mission. There are many ways to charge a fee for your services. For instance, a charity that helps the unemployed find jobs could charge a fee for those services. Or a nonprofit music academy could charge for music lessons. A nonprofit preschool could charge for its educational programs. The IRS has a publication that spells out all the aspects of earned and unearned income. Reading it thoroughly and consulting with your legal counsel would be wise before deciding to charge for any services or products. If your earned income project is not deemed appropriate and in line with your nonprofit status, you could pay hefty taxes and even penalties. You could even lose your tax-exempt status. It would be best to decide before you set up your nonprofit and file for 501(c)(3) status whether earned income will be part of your funding plan. Rather than charge a fee, some nonprofits have "voluntary" donations. They suggest that a user or client help provide services by giving a gift instead of charging a fee. It's common, for instance, to see a donation box at the entrance to a museum where admission is otherwise "free." That idea can be applied to a variety of nonprofit situations. Be careful, however, that you do not coerce or shame anyone into donating. It has to be voluntary. One way to do this is to post a fee schedule that provides information such as how much your service costs to provide, and an invitation for users to donate an amount of their choosing. Some nonprofits even offer ranges to make it easier, such as $25-$50 dollars. There is some evidence that people, even when financially challenged, like to donate something rather than to receive just a "handout." Whether or not you invite donations will depend greatly on the nature of your organization and the service you provide. A soup kitchen that provides food to the homeless is not a very appropriate place to ask for donations. In any case, consider including earned income as part of your revenue mix. Many nonprofits flourish with a combination of charitable donations from the public and earned income. Your nonprofit could develop a steady source of revenue to offset the ups and downs of donations and grants. Should a Charity Sell Ads in Its Newsletter?